As summer is in full swing and June is dwindling down the next big summer event is the Fourth of July! 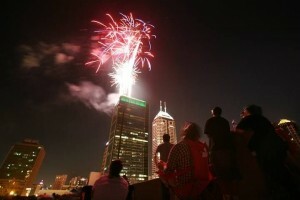 Indianapolis, IN and the surrounding communities have plenty of events for celebrating our nation and partaking in some Fourth of July festivities, including fireworks! If you don’t have plans yet the Heard Real Estate Team has compiled a list of some area favorites for you to explore. Zionsville 4th of July Fireworks. Don’t miss an All-American July 4th Celebration in Lions Park. Sponsored by the Lions Club, the activities start at 5pm with kids games (moonwalk, face painting and more). More food, games, music and fun, right up to the fireworks at dusk! In case of rain, we’ll celebrate on the 5th. The celebration is free, premium parking passes can be purchased for $5. INDYpendence Day Concert for Cancer. The 4th annual INDYpendence Day Concert for Cancer is a two-day music festival taking place July 2 – 3 from 2 – 10 p.m. each day on Pan Am Plaza. The event will feature several national music acts, food trucks and vendors. The Saturday lineup includes: Charlie Breeze, Sirius Blvck, Breakdown Kings, Audiodacity, Coastl, The Lost Kings, Mike Stud & Ludacris. General admission tickets are $30 or $50 for both days. This event benefits Riley Hospital for Children and St. Francis Patient Assist Fund. Donatos Downtown Freedom Blast. Watch as Indy’s largest fireworks display lights up the skyline during the Donatos Downtown Freedom Blast, shooting from the top of the Region’s Bank Tower at 10 p.m.The show will be synchronized to patriotic and popular music broadcasted on radio stations 97.1 HANK FM, Soft Rock B105.7, 93.1 WIBC and 1070 The Fan. Bring a blanket and grab your spot early to watch the fireworks at the Indiana War Memorial grounds. Kids can enjoy face painting, bounce houses, games and more beginning at 6:30 p.m.